Built from pimcore/pimcore@a02db3 with pimcore-docs@7e2aaa . quantity value number input with an additional unit. available units can be configured centrally. 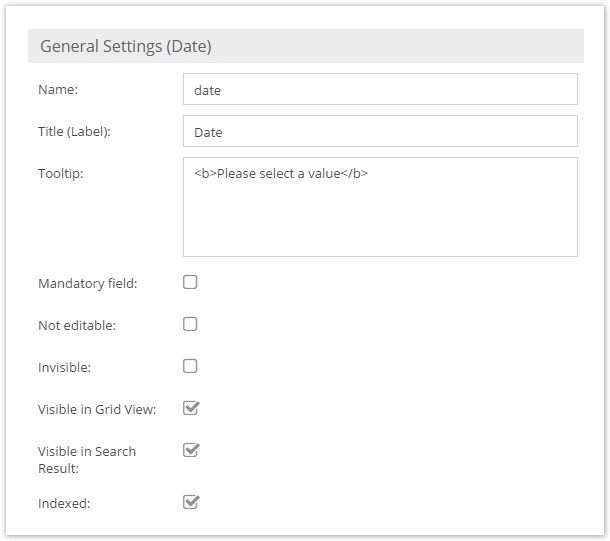 In the user settings the object dependencies of each user are shown in the second tab panel. All objects which reference the selected user are listed in a grid view. If one needs to find out which objects hold a reference to a specific user, the Pimcore\\Tool\\Admin::getObjectsReferencingUser($userId) method can be used to find all referencing objects. classificationstore advanced store for classification systems like ETIM, ecl@ss, etc. All data types are wrapped in an object derived from Pimcore\Model\DataObject\Class\Data. These data type objects provide getters and setters and they define the Description in the frontend. Data type objects are displayed in the first column of the table above. The second column indicates the underlying data type class and the third column outlines the Description used in Pimcore to fill in, edit and display data objects. Besides the name, which is the name of the object's property and the title, which is shown in the GUI, an object field has the general configuration options listed below. The title can be translated for different system languages. Please see the article about Translations to find out how to add object field translations. indexed: puts an index on this column in the database Moreover, each data field can have a tooltip, which is shown when the mouse hovers over the input field. unique: currently the input and numeric data type allows to add a unique constraint.If checked, the values will also be indexed. Note that only works on top level attributes and not on nested stuff inside localized fields etc. The layout settings allow to apply custom CSS to any object field. Please note that renaming a field means the loss of data from the field in all objects using this class. See sub-pages of this page for detail documentation of different data types.